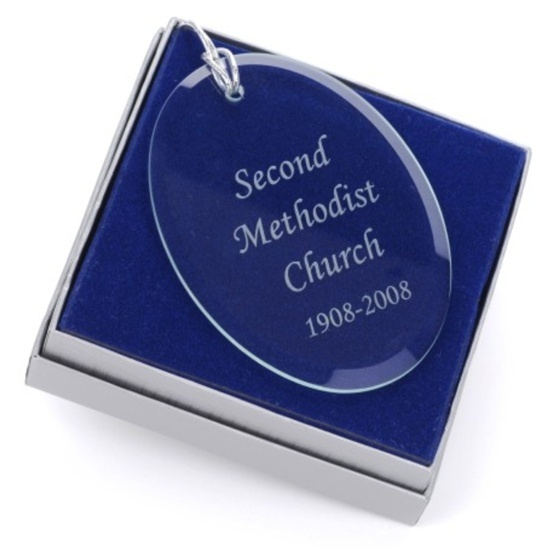 Flat optical glass ornament with beveled edge. Crystal clear. Long engraving space for year round decoration and remembrance. . 2-1/2 in. at widest x 3-1/2 inches long. We purchased these ornaments as gifts for our graduating seniors. Not only do they look amazing (pictures don't do justice), the turnaround time was super-fast. A+ all-around. We'll be back for more next year! I was looking for a special ornament for my son to recognize a major accomplishment in his career. Luckily I found New England Ornaments. When I called on 12/20, after 4PM, just to inquire about chances of having the item by Christmas, they explained they were rushing orders and it should be fine as they would get it to the post office the next day (since they'd already made their run for that day). In checking out (at 4:11PM), I noted that if they felt it necessary to bump up to priority shipping, that was fine with me. Shortly after they called and said they were going to send the ornament THAT DAY (must have been near closing time by then) and confirmed OK to use priority shipping. I received a confirmation that the item had been shipped at 5:01PM!! I assume they made a special trip to the post office for this! The item arrived in a pretty silver box with a ribbon already on it, so no wrapping needed! Excellent company to deal with !!!! I just wanted to write how touched I was to receive my ornament and the hand written note on the side of the form. I had given my mom ornaments from you to honor my grandparent's lives after their passing and I knew my aunt after her battle with cancer needed to be on her tree. There was only one company I wanted to use, New England Ornamnets the glass is beautiful and the care you put into the words right up to the bow on the box. This is a company that cares and I thank you for beautiful ornaments for they help keep my loved ones near.